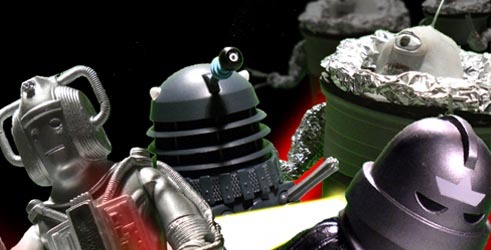 Over the last few years, this site has supported the Outpost Doctor Who Forum. It's a friendly, non pretentious place and most of its members are toycentric. So in 2012, I came up with the idea of doing an April Fool's story. A little comedy episode that would run on ODW for a page a day in the first week of April. I'd considered a few ideas for the story before hitting upon an idea using the Trods- a concept ripe for a mickey-take. I decided quite quickly what the point of the story would be and where the comedy lay and since it was basically one scene it was pretty simple to come up with the script. 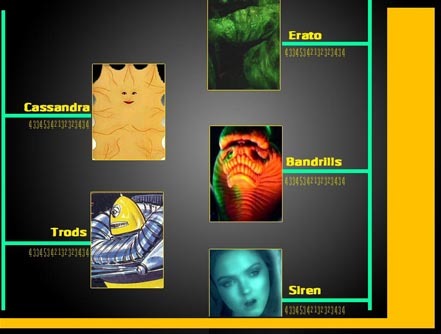 The fifth page with the inclusion of the Zygon twist was a late addition. The script was completed on 28th March 2012. Shooting began immediately on 28th March 2012 and was a simple affair, given that it only required one set. 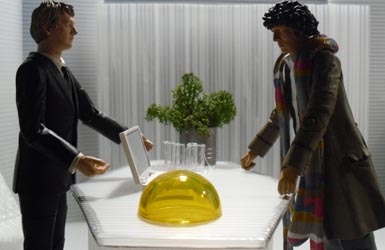 The set is very simple, made from those white plastic envelope stiffeners and dressed with a few mini plants, a plastic yellow dome and furniture made from the same plastic as the walls. The secretary's office was shot first. The set was dressed up with green plastic walls (used for Gallifrey in Empire of the Time Lords). She's using a red doll's house phone. The main office was done next. The director's laptop is from the Buffy The Vampire Slayer accessory pack. 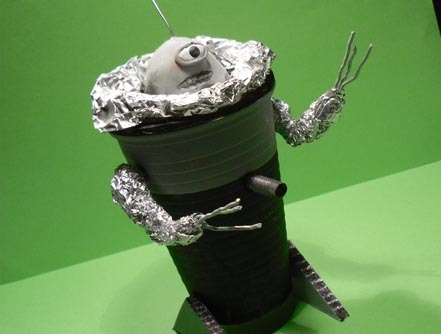 Finally, I shot some greenscreen stuff of the Trod, Dalek, Cyberman and Sontaran for the cutaway shot on page 3. The edit was relatively simple too and completed on 29th March 2012. 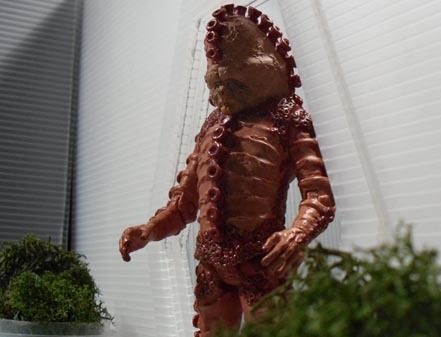 The only real effects were compositing the cutaway of the Trod attacking other monsters and the transforming shots of the Doctor into the Trod, Director into the Doctor and the Doctor finally into the Zygon. 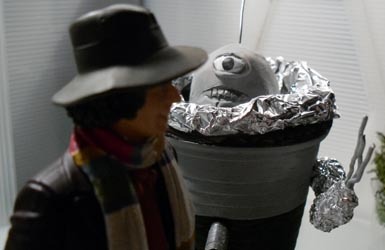 The story appeared exclusively on Outpost Doctor Who Forum in April 2012. It was posted on the AFT site proper on 24 March 2014. Since this is a little comedy aside, it doesn't really have to be considered part of the Doctor Who/ AFT canon. Yet it is here. 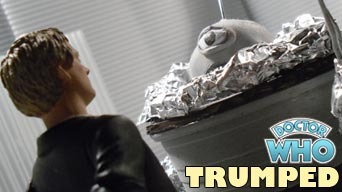 If you want to make the leap that a Top Trumps corporation exists in the Whoniverse, please feel free.